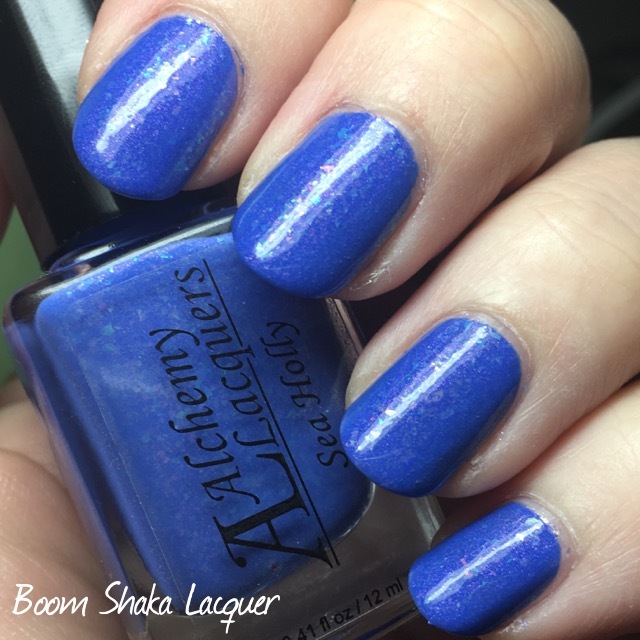 Alchemy Lacquers April Lab Report – Swatches and Review! Hello my lovely readers! I hope that you enjoyed The Switching Post. Plans for this month’s Switch are already underway…and you won’t believe who I’m switching with this month! Trust me it’s going to be awesome! 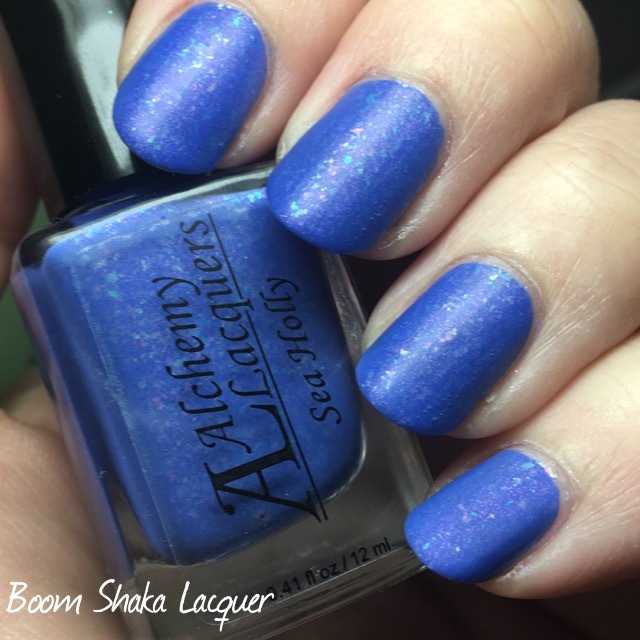 Today though I have some fantastic polishes from Alchemy Lacquers to show you, including the April Potion LE! You’re not going to want to miss this so settle on in while I share some pretty polishes with you! Sea of Snapdragons is a perfect spring color. Really it doesn’t get springier (not a word, as usual I totally don’t care) than this! 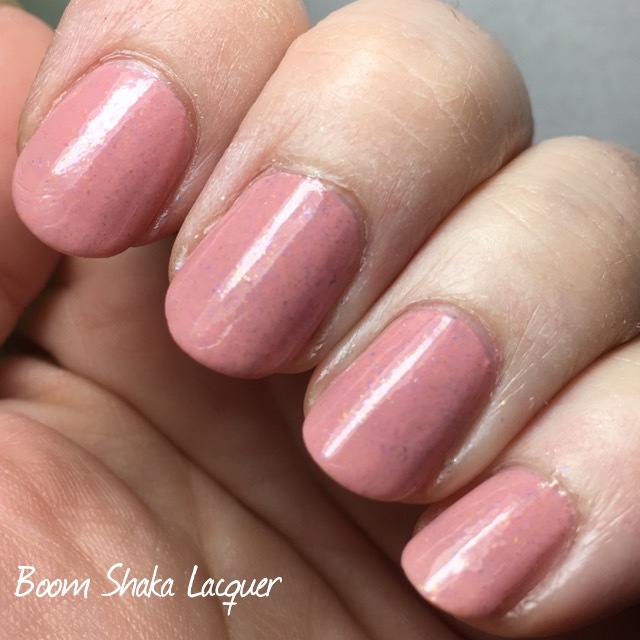 This beauty is a soft mauve pink creme polish filled with iridescent micro-flakies, gold micro-flakies, and the teensiest tiniest holographic glitter/sparks. It’s shimmery and lovely. Let’s talk about formula! The formula on this is really good. Like any good creme polish it went on and was opaque in two coats. Has good self-leveling. I didn’t have any problems with streaks or drags. There appears to be a slight wrinkle on my forefinger but that’s because of me, I touched it and left a fingerprint and didn’t realize it until just now! Ha! This one is definitely a winner. Pictures show two coats plus topcoat. Oh to the Em to the Gee. This one is beyond amazing. Seriously, I nearly lost what little chill I had over this one. Gorgeous dark cornflower (Thanks Christina for that description *wink*) or dark periwinkle blue crelly…check! Seductive purple shimmer…check! Stunning color-shifting flakies…check! Check! Check! 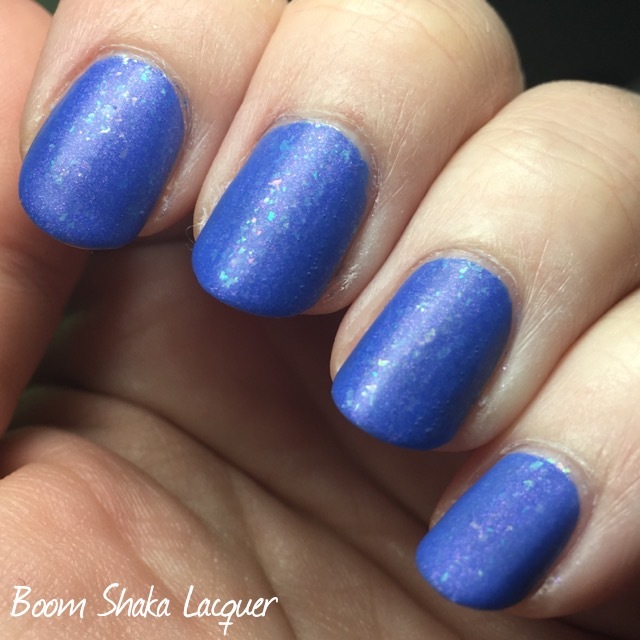 This polish checks all my boxes that’s for sure. 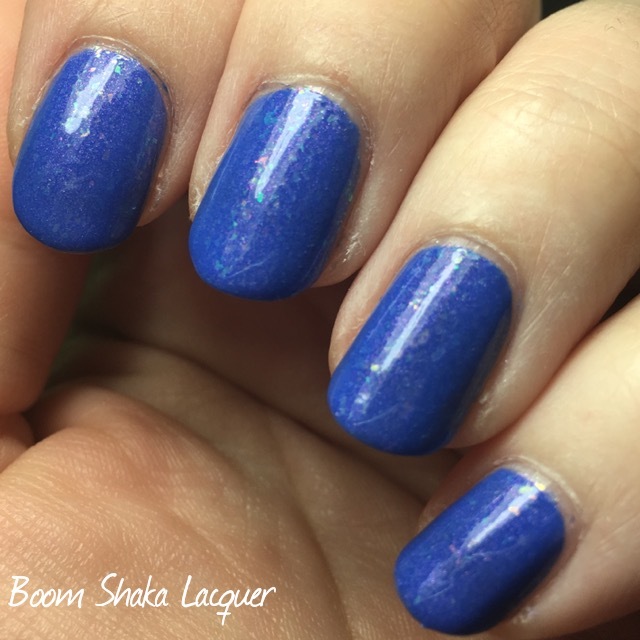 You all know I have a passion for blue, flakies, and complex polishes and this one fits that bill to a tee! I utterly fail at capturing the shimmer in my pictures but let me tell you in person on the nail it’s absolutely amazing. You can see it a bit more in the matte pics because matte topcoat makes all the goodies a little more prominent! Formula on this one was nothing short of perfection. This is slightly more on the crelly side than creme side of things but it was still opaque in two easy coats. I didn’t have any problems with all those gorgeous flakies clumping up or any other application issues. No streaks, drags, or balding here! Pictures show two coats plus topcoat in the shiny pics and two coats plus matte topcoat in the matte pics. Ok I really had a hard time not making this one my favorite. It’s definitely my favorite baby blue polish to date and I have a LOT of blue and baby blue nail polish. I seriously have a blue nail polish problem. Wait…that’s not right, it’s not really a problem. I NEED all the blue nail polish! 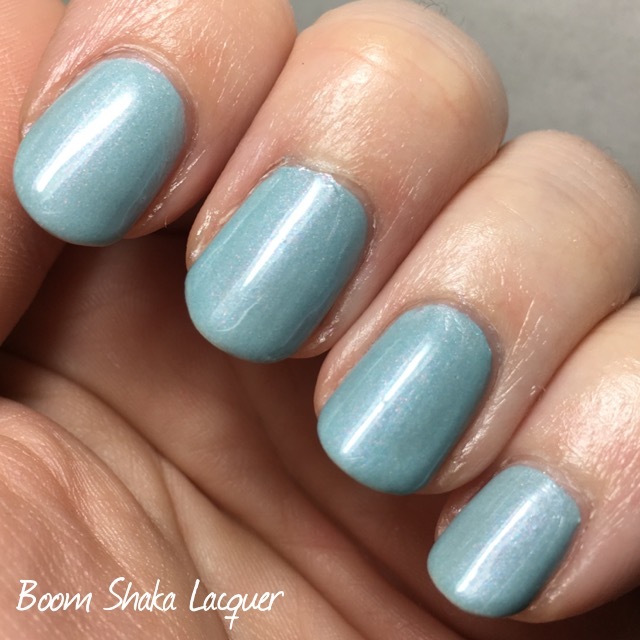 Restoration Tonic is a perfect baby blue crelly polish packed with stunning shimmer. I see red/pink shimmer and blue shimmer. The shimmer gives it a pearly kind of quality without being frosty, which, for me is fantastic since I’m not a fan of frosty polishes! 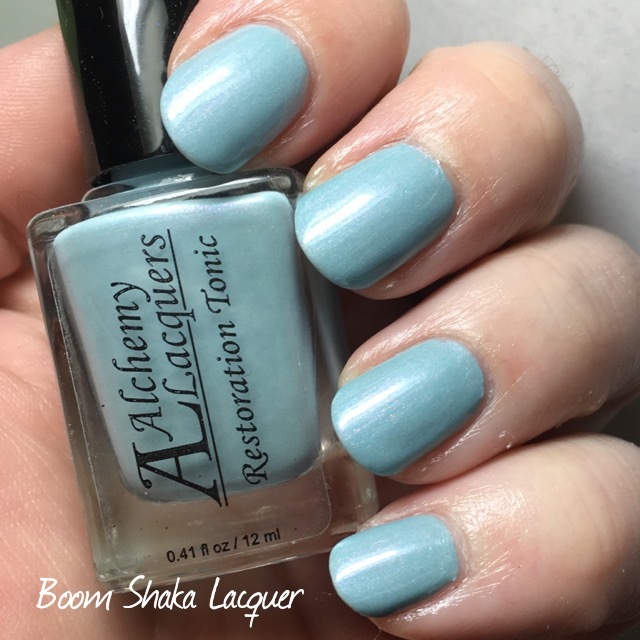 Restoration Tonic is a gorgeous crelly formula that is opaque in two coats. I had zero issues with application or performance. In fact I’ve been wearing Restoration Tonic for a week now and I have just very minimal tip wear. Even though it’s shimmery and pearly (probably not a word) it does not get brushstrokey (again not a word but you know what I mean). Pictures show two coats plus topcoat. Oh and did I mention? This polish comes with a set of adorable pink glittery vinyl decals with flowers, butterflies, birds, and rain clouds! I’ll have a nail art look I did with those and Restoration Tonic on my Instagram later! 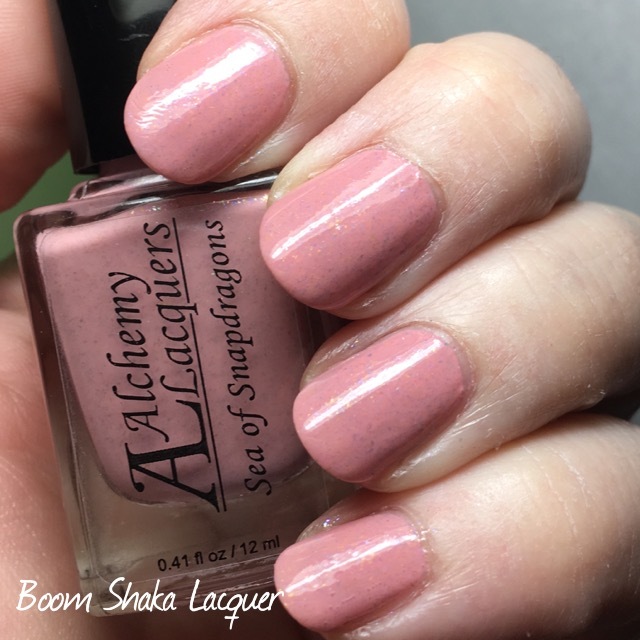 Also, typically these Potions are only available through the month that they are released however Alchemy Lacquers will be on vacation from the end of this month until the end of May so this will actually be around again when she reopens but hey, why wait…you know you need it now! So you want to know when YOU can get these gorgeous, happy, spring colors? Well I’m going to tell you…TOMORROW, April 15th. I’ll include all the pertinent links below. Which one of these are you the most excited for? Let me know in the comments!